Your Nancy K Brown wood foot file / paddle is constructed with the highest quality materials and designed to give you long and faithful service. 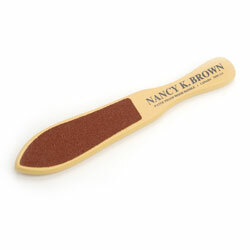 Giving your Nancy K Brown wooden foot file / paddle a little tender loving care will allow it to continue giving you efficient service in removing calluses and keeping your feet in great shape. Using it with Nancy K Brown's Foot Maintenance / Repair Cream will elevate your foot care to a new level - your feet will thank you for it. Have toe nail and foot fungus problems use Formula F anti-microbial the solution for fungus related issues - available in Formula F brush-on and Formula F spray.